The core concept for Korea’s ‘Future Warrrior’ soldier modernisation programme is to develop a warrior as a system in an NCW-based battlefield. Industry and government are working together to secure key technologies for the development of an optimised modular solution, addressing cost, performance and weight, delivering capability in five key areas; battlefield visibility, network centric operations, effective precision strike, decisive offensive manoeuvre and continuous protection and support. The basic capabilities for the Future Warrior System (FWS) mirror those of NATO’s analysis of capabilities with Korea opting for the categories of Command and Control systems, Mobility, Lethality, Survivability and Sustainability. The threat the Republic of Korea faces is self evident. In terms of detection capabilities, the Army has cited the need for the detection of various types of enemies, spread across wide areas with the ability to detect enemy detection being limited, due to concealment and cover in mountainous and urban terrain, with the former consisting of 60 percent of the total terrain that the FWS is expected to operate in. The acquisition strategy for FWS is considering six ‘variants’ of FWS in how it proceeds; Regular Force, Irregular Force and Special Force Warrior and Combat / Combat support / Combat Service Support warrior. The master plan for FWS in fielding the eventual capability Korea envisages moving through three stages consisting of a soldier equipped with Individual Equipment, Modular-type and finally an Integrated-type solution. The first major step on the path to fielding a system has been a study on the optimisation of technology for the Future Warrior System. This phase of the programme has been led by the Agency for Defence Development (ADD) with the Applied Research phase beginning in June 2009 and is due to be completed in December 2011. Its remit is the acquisition of optimised technology for a Modular-type Future Warrior System, considering Cost, Weight and Performance. Work is also being undertaken to help draw up operational concepts for FWS. In selecting the technology needs for FWS, technology hierarchies are being formed with decisions informed through a variety of methods including comparisons with foreign nations, using methodologies such as Gordon’s Scoring Model and expert surveys. The technology will be acquired through a number of means with technology forecasting being considered as well as according to Technology Readiness Levels. It terms of relative technology levels that are expected from the FWS, the Korean Defence University puts US levels at 100, the UK at 88 and those for Korea at 78. ADD and the military are developing an integrated Battery Unit using two types of batteries; a Hybrid Fuel Cell combining a Fuel Cell and Lithium-Ion and a second Lithium-Ion battery. The systems will naturally use battery Management for optimal consumption and safety. Korea is investing heavily in communications technology for the project, the goal being the fielding of a Future Warrior radio for the real-time transmission of multi-format battlefield information, supporting audio communications, data communications, command and control, position/status reports and video communications. The individual radio will be capable of voice communications within the area of squad responsibility. The underlying C4I architecture assumes a fully digitized battlefield with information and speed-centric support for squad-level command and control operations. A major feature of this is interworking between the radio and the Tactical Information Communication Network programme. The FWS’ Wearable Computer will be used to display Tactical information using digital map, position information based on GPS and will also utilise voice recognition software and a Wireless Personal Area Network. Current plans show a four button type controller on the fore grip similar to that seen on FELIN and other programmes elsewhere in the world. The headborne subsystem comprises an Integrated Helmet, protecting the head, ears and temples with a Head Mount Display (HMD) which will be used to display tactical information with aural information undertaken via a bone-conduction earphone and neck microphone. Other key features of the subsystem include a Night Monocular, Scope, Ballistic Helmet, Gas Mask and AMOLED HMD which will display Tactical Map and Target Information. Each soldier will also be equipped with a bio and environmental sensing unit monitor. The individual body status information will provide measurement of the individual’s body heat, acceleration, electro-cardio information and temperature and well as being able to detect noxious gases and will interface with the system’s wearable Computer through which information can be transmitted. Body Armor Development for the FWS will consist of ballistic helmet, body armour vest and armour plate for integration using optimised armor material technology considering cost, weight and performance and aimed at further developed ballistic capabilities over five protective subsystems. Camouflage is also an integral part of the protection sub system. ADD’s Concept for CBR Protective Clothing includes mask, gloves and boots and uses materials which support selectively permeable membrane utilising evaporative cooling technology. In terms of Protective Clothing, current design choices include the uses of a Hood type design, designed to lower heat stress, better spray/oil repellency and will be washable and is very much part of the Human Systems Integration strategy for the programme. The design will be interfaced with the other FWS components. The current design is integrated overall with the US JSLIST and is seen as a stepping stone to the desired ultimate design. CBRN equipment should be free from interference with other equipment as well as make it possible for the soldier to drink and talk. The Future Warrior Gas Mask will use a single lens and a dual sided filter, using a Non-Cr active carbon solution with a Stopper design for the hood system. 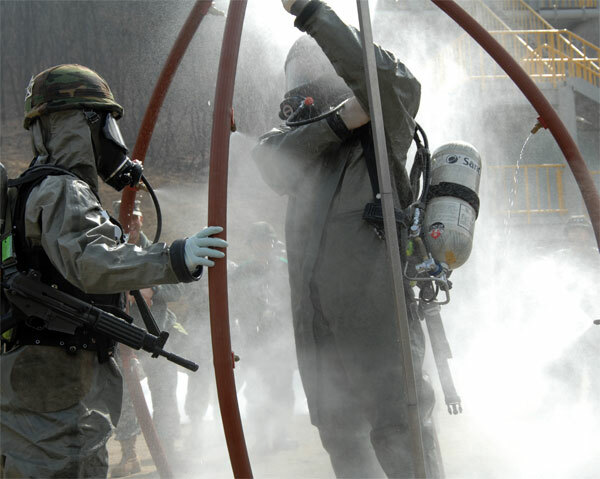 The US M50 mask is seen as a similar capacity to what Korea is seeking. The FWS’ Fire Control System consists of a Day and Night Sight, Sighting Scope and Video Transceiver on the weapon with wireless communication with optional wired communication to link the body worn video receiver with the weapon mounted Day/Night Sight which will also support Indirect Fire functions, notably airburst through its new K11 rifle mounted grenade system. In the development and fielding of Korea’s Future Warrior, considerable investment in and use of simulation and virtual environments is planned. This will cover Operational Concepts and Scenarios for FWS, built-in Training Scenario, Demonstration, Experimental Systems, Virtual Command Post, High Performance COTS hardware and Graphic based 3D Virtual assessments.